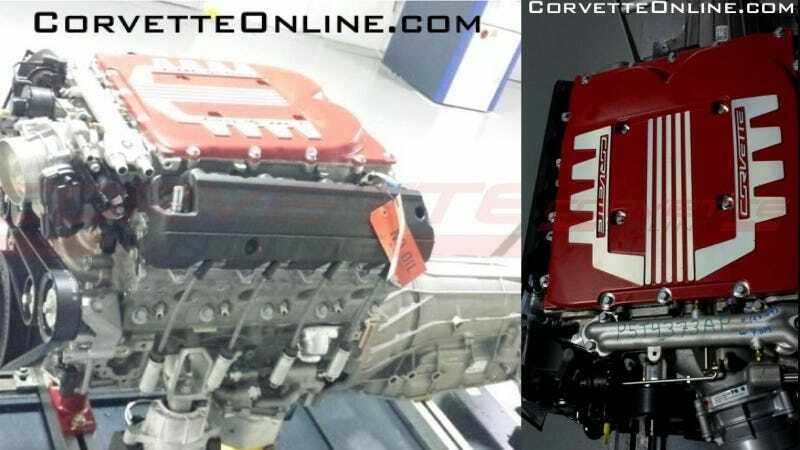 Could This Be The C7 Corvette ZR1's Supercharged Engine? The new 2014 Corvette Stingray has proved to be so excellent that many people have wondered how GM can improve upon it for future Z06 or ZR1 versions. Our guess? MOAR POWER. Now the folks at Corvette Online have photos of what may be a supercharged V8 that could see duty in one of those cars. The engine in the photos is definitely an LT1-style, Gen V Chevy small block, as evidenced by the injector cover shape and the fact that the throttle body is consistent with the ones used on the C7′s LT1. And it’s clearly a twin-rotor supercharged engine with the LSA/LS9 style pulley mounted high on the front, and intercooler plumbing also bearing a resemblance to previous heat exchanger setups. It very well could be the real deal. What we don't know is how much power it will put out or what car it could see duty in. The outgoing C6 Z06, which was naturally aspirated, had 505 horsepower; the supercharged 6.2-liter ZR1 had 638. This is clearly like the latter, but who knows what the General has up its sleeve. Any guesses? Feel free to drop them in the comments.